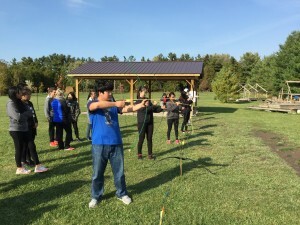 Camp Kintail is fantastic choice for an overnight trip for your students. Staying overnight gives the students a chance to spend more time together and do more exciting activities. Camp wide games like capture the flag after supper, followed by a campfire and a snack with your friends are what make for great memories. Camp Kintail has insulated cabins with electricity for lights and heating when it is needed. Camp Kintail staff can stay in the cabins with the students at night if that is desired. Teachers are provided with accommodation in Feathers, our all season cottage on site. Feathers boasts a full bathroom, another half-bathroom, 3 bedrooms, a sitting room, a full kitchen, a bbq and a private covered porch. To see more information on our buildings, click on the button below. We have groups stay for two, three, four days, or more. You decide how long you want to come to Camp Kintail for and we will work with you to create a fantastic program for your entire stay. All of the activities that are available for a day trip are available for overnight trips. You just get to do more of them! We are happy to discuss your needs and wants, and create a program to suit your goals for the trip and the number of students coming. You are always welcome to come and have a tour of the site, meet the staff, and see the program options.